A computer model is a needed tool for surface water management purposes. For long term planning, the State can use hydrologic model in making regulatory decisions by evaluating potential impacts of proposed projects with significant water withdrawals within the basin and interbasin transfer permit application, planning for increased water use due to continuous growth, and in real time in managing the basin having challenges of resources, and operational and regulatory constraints during a drought condition. 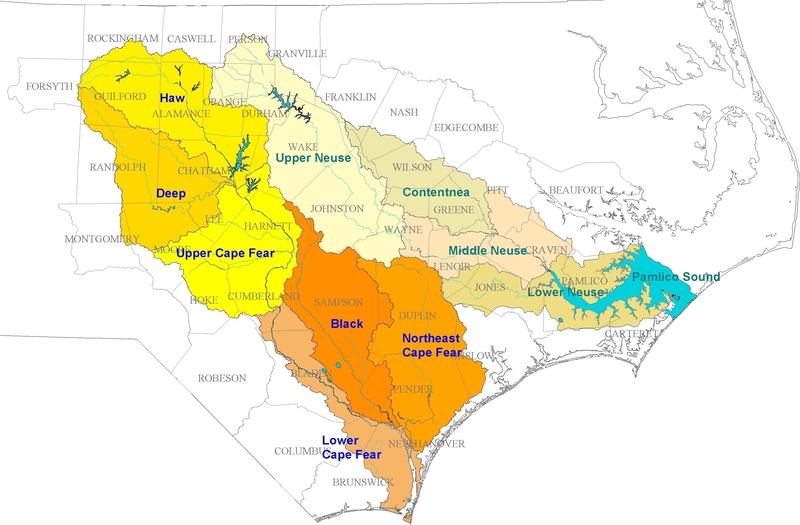 The original Cape Fear and Neuse River Basin Hydrologic models were developed earlier in 2004 and 2008 for the use of Cape Fear and Neuse river basins. This project is for updating and consolidating the two existing river basin models into one, a joint model. The contract for model update was approved and final contract signed in July 2013. The project was started along with Jordan Lake Allocation Round 4 (http://www.ncwater.org/Permits_and_Registration/Jordan_Lake_Water_Supply_Allocation/). The Triangle area water demand is supplied from the reservoirs and rivers in both Neuse and Cape Fear River basins. These special demand and supply conditions and interbasin transfers of water have initiated the project to combine the two models for evaluation of this unique regional water supply sources for future demand and impact of water transfer and allocation of Jordan Lake water. The background information of the previous version of the (Cape Fear and Neuse Models are available on the basin model pages. OASIS, a patented, mass balance, water resources simulation/optimization model is being developed for the Cape Fear and Neuse river basins. This combined two-basin model will use the finest practical geographic resolution and time step. How can I get access to the model? Contact Charles Theobald (charles.theobald@ncdenr.gov) or Neela Sarwar (neelufa.sarwar@ncdenr.gov) to request access to the model.